The object of Blackjack Switch is for the total of your cards in either hand to be closer to 21 than the dealer�s cards, without exceeding 21. Card values are the same as in standard Blackjack � aces count as either 1 or 11, face cards as 10, and number cards as their face value. The rules are the same as in standard Blackjack (see here). Except you have two hands, which you play in turn � first the right and then the left one, then the dealer plays his hand. You may split, double, take insurance etc. just like in standard Blackjack. An exception from the standard Blackjack is that the dealer always hits soft 17 � meaning he always draws one more card when he has 17 with an ace counted as 11. Also, �Blackjacks� pay 1/1 instead of 3/2 although more �Blackjacks� are created due to the �switching� option. (See below). Another exception is that Blackjack rule no. 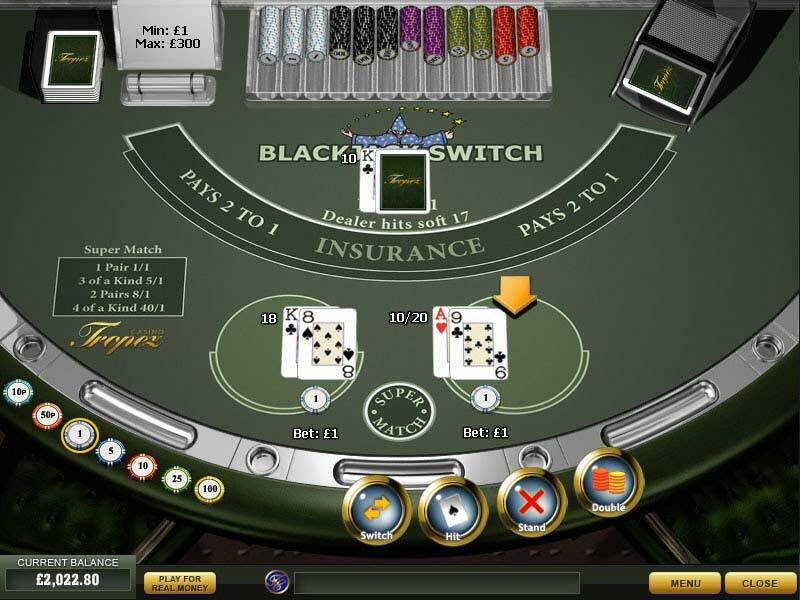 5 (�If the player doubles and the dealer�s first card is of value 10, and the dealer gets blackjack, the player loses only the initial bet.�) does not apply in Blackjack Switch. Switch - Prior to any hits, you may switch the top cards of your two hands. Push 22 - Dealer will �push� on a total of 22 (except 'Blackjacks' will still win). This means that whenever the dealer's total reaches 22 then all bets are 'pushed', regardless of their total except if a player has a �Blackjack�, which will still win. Super Match - The small circle between the standard bet areas is the super bet area. The super bet wins if your initial 4 cards contain 2 or more matching cards. For example, if your right hand is a Queen and a Six, and your left hand a Queen and a King, you have a pair and your super bet wins. The win ratios are written on the table.